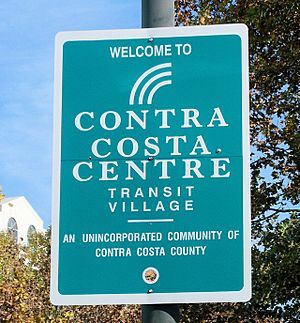 Sign at Contra Costa Centre Transit Village, an unincorporated community in Contra Costa County, California, United States, north of the city of Walnut Creek. In law, an unincorporated area or unincorporated community is a region of land that is not governed by its own local municipal corporation, but rather is administered as part of larger administrative divisions, such as a township, parish, borough, county, city, canton, state, province or country. Occasionally, municipalities dissolve or disincorporate, which may happen if they become fiscally insolvent, and services become the responsibility of a higher administration. In some countries, such as in Brazil, Japan, France or the United Kingdom, all parts of the country are incorporated. Unlike many other countries, Australia has only one level of local government immediately beneath state and territorial governments. A local government area (LGA) often contains several towns and even entire cities. Thus, aside from very sparsely populated areas and a few other special cases, almost all of Australia is part of an LGA. Unincorporated areas are often in remote locations, cover vast areas and/or have very small populations. The entire area of the Czech Republic is divided into municipalities (Obce), with the only exception being 5 military areas. These are parts of the regions and do not form self-governing municipalities, but are rather governed by military offices (újezdní úřad), which are subordinate to the Ministry of Defense. † Brdy Military Area was scheduled to be abandoned by the Army in 2015 and converted into Landscape park (protected area), with its area being incorporated either into existing municipalities or municipalities newly established from the existing settlements. The other four Military Areas are scheduled to be reduced in size in 2015 too. The decisions on whether the settlements join existing municipalities or form new ones are decided in plebiscites. In 2000, the number of unincorporated areas in Germany, called gemeindefreie Gebiete (municipality-free areas) or singular gemeindefreies Gebiet, was 295 with a total area of 4,890.33 km² and around 1.4% of its territory. As of December 31, 2007[update], Germany had 248 uninhabited unincorporated areas (of which 214 are located in Bavaria), not belonging to any municipality, consisting mostly of forested areas, lakes and larger rivers. There were also three inhabited unincorporated areas, all of which served as military training areas: Osterheide and Lohheide in Lower Saxony, and Gutsbezirk Münsingen in Baden-Württemberg. They had fewer than 2,000 inhabitants in total. Gutsbezirk Münsingen, after losing its inhabited parts to adjacent municipalities on 1 January 2011, is uninhabited now. The most recent period with unincorporated land started in 1967 when the dyke around Southern Flevoland was closed. It however requires several years before the polder is genuinely accessible for cultivation and construction of roads and homes can start, as in the first years the soil is equivalent to quick sand. During the initial period of inhabitation a special, government-appointed officer was installed, known as the Landdrost. During the administrative office of a Landdrost there is no municipal council. Some American states have no unincorporated land areas; these include Connecticut, Massachusetts, New Jersey, New York, Pennsylvania and Rhode Island, although these states all have communities that are not separately incorporated but are part of a larger municipality. Due to differences in state laws regarding the incorporation of communities, there is a great variation in the distribution and nature of unincorporated areas. Unincorporated regions are essentially nonexistent in seven of the northeastern states. All of the land in New Jersey, Pennsylvania, Connecticut, Massachusetts, and Rhode Island, and nearly all of the land in New Hampshire and Vermont, is part of an incorporated area of some type. In these areas, types (and official names) of local government entities can vary. In New England (which includes the last five of those seven states, plus the less fully incorporated state of Maine), local municipalities are known as towns or cities, and most towns are administered by a form of direct democracy, such as the open town meeting or representative town meeting. Larger towns in New England may be incorporated as cities, with some form of mayor-council government. In New Jersey multiple types exist as well, such as city, township, town, borough, or village, but these differences are in the structure of the legislative branches, not in the powers or functions of the entities themselves. On the opposite end of the spectrum is the Virginia "strong county" model. Virginia and other states with this model, such as Alabama, Maryland, and Tennessee, set strict requirements on incorporation or grant counties and townships broad powers that in other states are carried out by cities, creating a disincentive to incorporate, and thus have large, urbanized areas which have no municipal government below the county or township level. 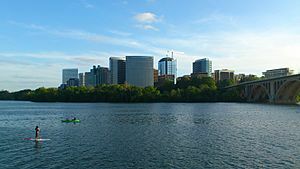 Throughout the U.S., some large cities have annexed all surrounding unincorporated areas, creating what are known as consolidated city–county forms of government (e.g., Jacksonville, Florida and Nashville, Tennessee). In areas of sparse population the majority of the land in any given state may be unincorporated. In California, all counties except the City and County of San Francisco have unincorporated areas. Even in highly populated counties, the unincorporated portions may contain a large number of inhabitants. In Los Angeles County, the county government estimates the population of its unincorporated areas to exceed one million people. Despite having 88 incorporated cities and towns, including the state's most populous, 65% of the land in Los Angeles County is unincorporated, this mostly consisting of Angeles National Forest and sparsely populated regions to its north. California law makes no distinction between “city” and “town”, and municipalities may use either term in their official names. However, the USPS is very conservative about recognizing new place names for use in mailing addresses, and typically only does so when a place incorporates. The original place name associated with a ZIP code is still maintained as the "default" place name, even though the name of the newly incorporated place is more accurate. As an example, Sandy Springs is one of the most populated places in Georgia, but is served by a branch of the Atlanta post office. Only after the city was incorporated in 2005 has "Sandy Springs" been approved by the USPS for use in mailing addresses, though "Atlanta" remains the default name. Accordingly, "Atlanta" is the only accepted place name for mailing addresses in the nearby unincorporated town of Vinings, also served by a branch of the Atlanta post office, even though Vinings is in Cobb County and Atlanta is in Fulton County. In contrast, neighboring Mableton has not been incorporated in nearly a century, but has its own post office and thus "Mableton" is the only acceptable place name for mailing addresses in the town. The areas of Dulah and Faria, California are unincorporated areas in Ventura County between Ventura and Carpinteria have the ZIP code of 93001, which is assigned to the post office at 675 E Santa Clara St in Ventura; thus, all mail to those two areas is addressed to Ventura. Slovakia (except for the military areas, which are administered directly by state government) is divided into communes. Many countries, especially those with many centuries of history using multiple tiers of local government, do not use the concept of an unincorporated place. The whole of the territories of Austria, Belgium, Bosnia and Herzegovina, Estonia, Finland, Italy, Japan, the Netherlands, Poland, Portugal, Serbia, Slovenia and Sweden are divided into municipalities. In Brazil and Mexico, all land must belong to a municipality. Even large uninhabited areas, such as forests or grasslands, are by law part of the nearest "city". This is because in Latin America, a "municipality" is the equivalent of what in the United States and Canada is called a "county". In the United Kingdom, in England, all land is within a county and/or local government district, both of which exercise power over their jurisdictions. In Scotland - all land is within one of 32 unitary authorities designated as Councils; In Wales, all land is within one of 22 single-tier principal areas. In Northern Ireland, all land is within one of 11 districts. In Japan, every piece of land belongs to a municipal either a city (市 shi) or special ward (特別区 tokubetsu-ku) in urban area or a town (町 chō/machi) or village (村 mura/son) in a district (郡 gun). In Taiwan (Republic of China), every piece of land belongs to either an Urban/Rural township (鎮 zhèn/鄉 xiāng) or a County-controlled city (縣轄市 xiànxiáshì) in Counties (縣 xiàn), or Districts (區 qū) in cities (市 shì). There are, in total, 368 townships, County-controlled cities and Districts in Taiwan. See also Administrative divisions of the Republic of China. Unincorporated area Facts for Kids. Kiddle Encyclopedia.